What a beautiful day – the warmth of the sun, beautiful trees and the blue sky in the background which we appreciated all the more after the damp, gloomy weather we have recently experienced. After checking out a couple of properties for possible acquisition by Rainforest Rescue we went for a walk along the boardwalk at Jindalba. 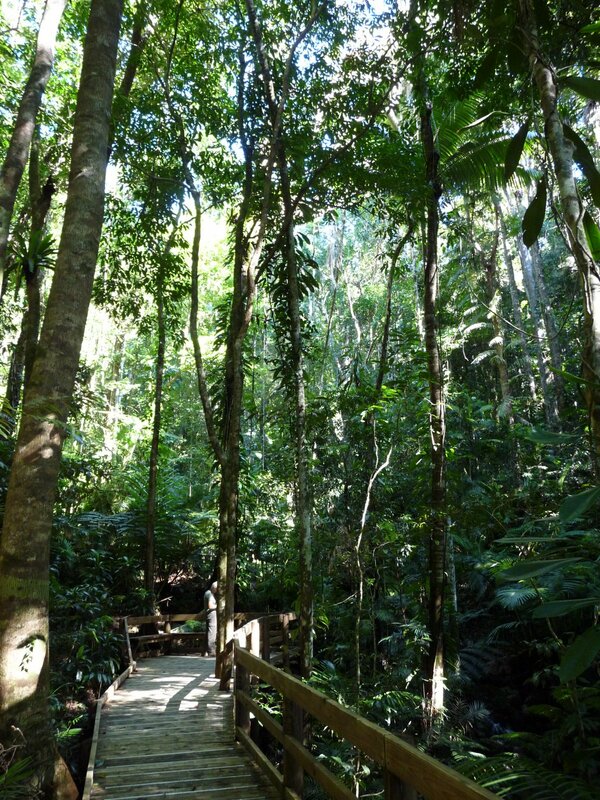 It is a short stroll through some lovely forest that we have visited many times because we enjoy it and it is the first National Park boardwalk along the Cape Tribulation road, only about 20 minutes north of the ferry crossing. I must admit to hoping we would see a Cassowary there as there have been many recent sightings. 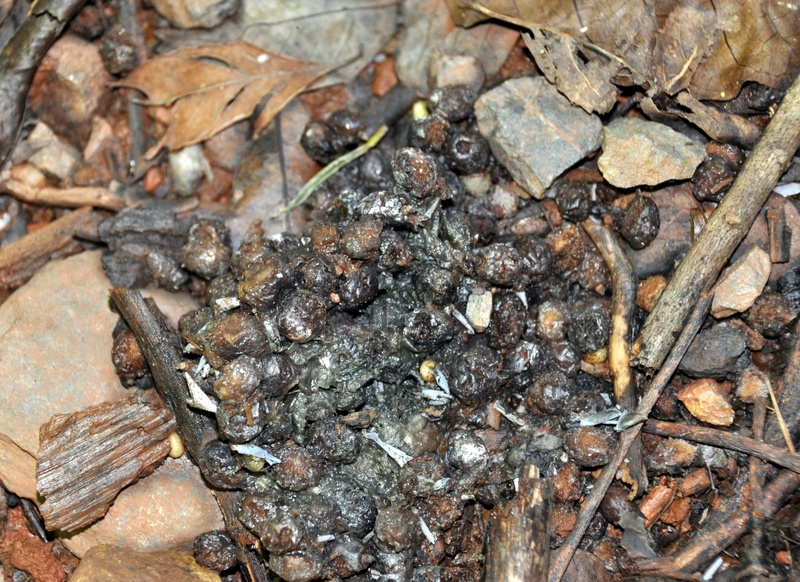 Allen found this Cassowary dropping just as he got out of the car, it must have come from quite a young bird as it is only a small pile of seed – we didn’t notice many fruiting trees yesterday and this poo is mostly full of palm seed from Alexandra Palms (Archontophoenix alexandrae). The owner of this little pile was not visible to us and we didn’t see any adults. Our travels took us a little further north into the Cow Bay subdivision where a number of blocks have been purchased for conservation, by Rainforest Rescue as well as through the Daintree Rescue Program which was jointly funded by the Federal and Queensland State governments. “Save the Cassowary” gives some background on the Daintree Buy-back for those who are not familiar with the history of the area. One of the most significant conservation efforts is The Baralba Corridor Nature Refuge. The original purchases were made by Daintree Rainforest Foundation – a small group of dedicated conservationists who raised money by holding raffles and selling tickets to tourists as they waited in line for the car ferry. DRF merged with Rainforest Rescue in 2004 and additional blocks have since been added to the corridor which provides a valuable link from the heights of Alexandra in the south to the Bailey’s Creek wetlands. While we were driving along one of the roads on the edge of the corridor we saw a cassowary cross the road quite a distance ahead of us. By the time we arrived at the point where she had walked into the forest Allen managed one quick shot. 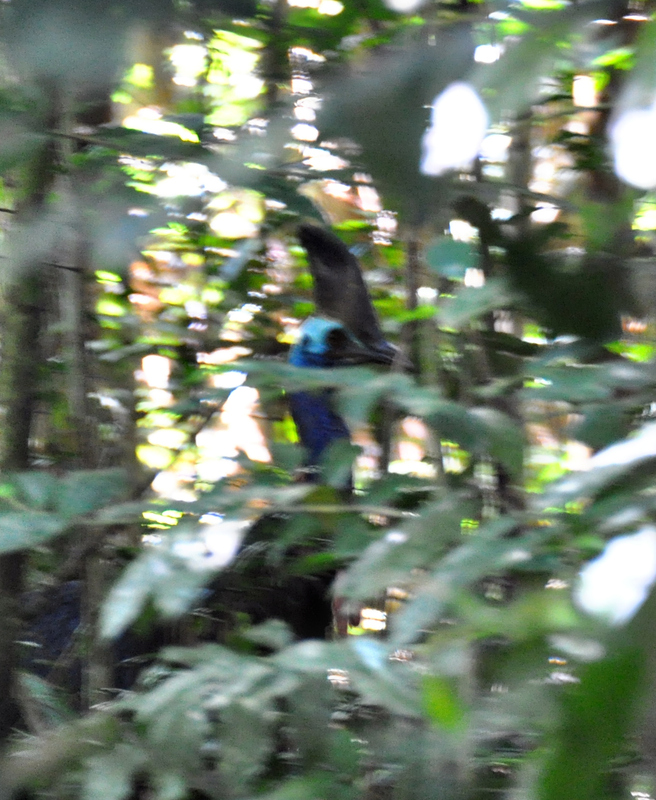 Although the photo is poor quality there is enough detail of the head, with the distinctive casque, for us to keep the photo on the Daintree Region Cassowary Group data base as a useful identification tool. This particular female cassowary has been known to regularly use the Baralba Corridor for many years, the size of her casque is indicative of a great age. This is a typical view of a cassowary, walking into the forest and disappearing from view rapidly but we were delighted to have this glimpse. While there are still blocks of land with the potential to be developed which need to be bought and conserved, it is wonderful to see what has already been achieved through buy-back and through revegetation of previously degraded areas. This entry was posted in Bird Observations and tagged Cassowary, Daintree Region Cassowary Group, Rainforest Rescue. Bookmark the permalink. Any cassowary sighting, even through the forest, is a good one! I agree Snail and even though it was a glimpse it was lovely to see the bird away from the main road.